Stan Awbery, J.P., M.P., The Story of St. Athan and Aberthaw, 1959. 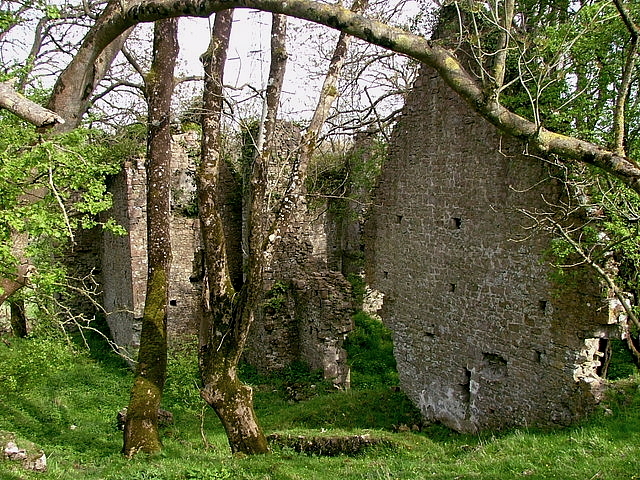 Although East Orchard, the residence of the Berkerolles, was called a castle, there is no evidence that it was fortified as such at any time, even when it was destroyed by Llywelyn Bren. It was probably a fortified manor house. Both the orchards were built by the Berkerolles who received the land from Robert Fitzhammon after the conquest of Glamorgan in 1091. They may have been fortified at a later period in order to protect the two famous orchards which had also been constructed and flourished from the time of Richard III, 1377, to Henry IV, (1399-1413). The canopied tomb of this family is still in the Church and will be described later. East Orchard is one of the mysterious ruins in the Vale. It must have been a substantial building. It had a chapel, a barn and a dovecote which stood on the brow of the hill. The columbariurn was 20 feet square with exterior steps leading to the upper floor. It had about 200 recesses, which were 7 ins. to 20 ins. deep, for doves or pigeons. It had no east wall to protect it from the marauders from the hills. The stronger fortified castles of Flemingston, Castleton and Bonvilston were for this purpose. A century ago it was an abandoned ruins, black with age and defaced by wind and rain, but in 1868 Mr. G. T. Clark examined it and found it possible to measure the various rooms. He states that the hall on the ground floor was 40 feet by 25 feet; the fireplace, 6 feet wide with a deep hearth and spacious chimney. The doors, however, had all been destroyed and the cellars filled with debris. The outside kitchen which was built a little distance from the house was 28 feet by 25 feet. The chapel's outside measurements were 44 feet by 19 feet. The walls were 12 feet high and 3 feet thick. It is said that the bellcote from the west gable was taken down and placed over the stables at Fonmon Castle. This was a peculiar and interesting ornament. It had eight sides with apertures, with the stonework tapering to a point at the top. This was probably erected at East Orchard about 1350 and transferred to Fonmon Castle about a century-and-a-half ago where it still stands.At the time Mr.Clark visited the Orchard he found the dovecote floorless and roofless, the chapel had no roof and the west wall was badly broken down. If you visit it today you will find very much less than he did a century ago. For many years it was the seat of the Berkerolles, The first of whom was a knight who came with Fitzhammon. Some people think that the Nerber family were the original possessors of this manor house. We know that in 1165 de Nerber held four knights fees under the Earl of Gloucester, which were no doubt in St. Athan. Of these fees one was held in 1315 by William Berkerolles. The Nerbers were only the lords of Castleton. Leland, the historian, refers to it as Norchete Manor which Mr. Stradling inherited and sometimes lived there. Some authorities state that a later Berkerolles, knowing that the land had been taken from the Welsh by conquest, decided to divide what he had among the descendants of the original owners on trust, and out of the reserve money he gave assistance to other families who had been dispossessed of their property by the Normans. The manor was in the possession of William Herbert of Swansea for some time, but it is believed that he held it on trust. In 1632 a survey was made and the boundaries of it were described as Castleton on the north, the river Thaw on the east, the sea on the south and the West Orchard and Gileston on the west.